Putting sailing rigs in the St Ayles Skiffs has been the topic of much 'lively discussion' recently. 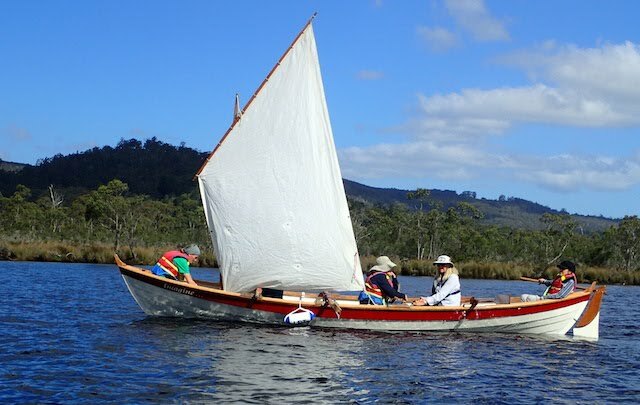 Iain Oughtred has designed an 'official' one, but the Kiwis, who have the best experience, are suggesting twin Optimist rigs because they will stow more easily in what is still essentially a rowing boat. Oblivious to all this a crew were happily sailing 'Imagine' with its own (loose footed, balanced lug?) sail yesterday evening. They say it goes quite well.